Abbotsford’s One Billion Rising event added a powerful voice with the recent inclusion of women’s rights advocate Rumana Monzur. The event, co-presented by the University of the Fraser Valley, takes place at Thunderbird Civic Plaza and The Reach Gallery Museum on International Women’s Day, March 8. Monzur made international headlines in June, 2011 after being brutally assaulted by her husband in Dhaka, Bangladesh. Enraged that his wife planned to return to further her education at the University of British Columbia, he attacked her to the point of partially blinding her, all while their daughter watched, horrified. The fact that attempts to save her sight were unsuccessful hasn’t deterred Monzur, who returned to Canada and now lives on UBC’s campus with her daughter and parents. Monzur is using braille and audio recording devices to study law, following up on her master’s degree in political science. Her husband was charged with attempted murder, but died in prison five months after the attack. Her commitment to education and unwillingness to concede in the face of incredible adversity makes Monzur an ideal keynote speaker for Abbotsford’s International Women’s Day event says Sharanjit Sandhra, coordinator of UFV’s Centre for Indo-Canadian Studies (CICS). According to Sandhra, who invited Monzur to participate, she exemplifies the challenges that led to the creation of the global activist movement called V-Day that grew into One Billion Rising events across the world. “For Rumana to have experienced such violence and aggression and come out not with bitterness, but with a renewed sense of spirit and drive to succeed is something that would motivate anyone,” says Sandhra, who is co-organizing the March 8 event. One Billion Rising began as a call to action based on the staggering statistic that 1 in 3 women will be beaten or raped during her lifetime. With the world population at 7 billion, this adds up to more than one billion women and girls. As the founder of Girlkind Foundation (a group that fights gendercide, combats gender discrimination, and raise awareness for women’s rights), Deesh Sekhon feels the amalgamation of International Women’s Day and One Billion Rising events in Canada is a day to look at challenges, but also success. “It’s a day to celebrate the inspirational and brave work women around the world are doing to secure women’s and girl’s rights and create better and equitable societies,” she says. In addition to the Centre for Indo-Canadian Studies and Girlkind, other event partners include: The Reach Gallery Museum, Abbotsford, The Fraser Valley Coalition for Women, Abbotsford Community Services, Women’s Resource Society of the Fraser Valley, Christine Lamb House, and The International Centre for Criminal Law Reform and Criminal Justice Policy. 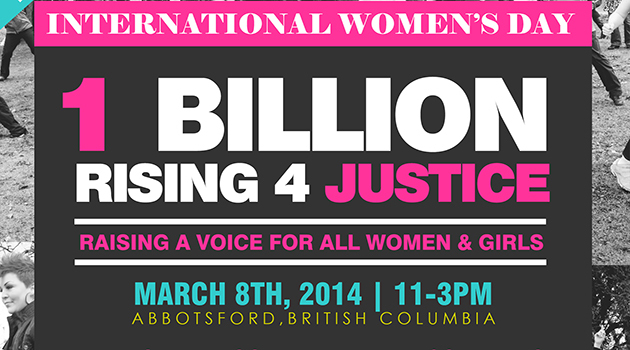 Abbotsford’s One Billion Rising event runs Saturday, March 8 from 11 am – 3 pm, with Monzur’s keynote at 1 pm. Parts of the event will be outside at Thunderbird Civic Plaza (adjacent to The Reach) with the keynote and film taking place inside The Reach. The event is free but registration is recommended for the film screening as seats will fill up fast. For more information visit www.vday.org, or email sharanjit.sandhra@ufv.ca.